Bisphenol A or BPA, is a chemical used to make plastics including materials that come into contact with food such as refillable drinks bottles and food storage containers. It’s also used to make protective coatings and linings for food and drinks cans. Below you can read our answers to frequently-asked-questions about BPA, and find out more about EFSA’s two-stage public consultation on its draft opinion on the possible risks to public health from bisphenol A (BPA). Minute amounts of BPA can transfer from packaging into food and drinks, but independent experts have advised that these levels of exposure are not considered to be harmful. Independent studies have shown that, even when consumed at high levels, BPA is rapidly absorbed, detoxified, and eliminated from humans and, therefore, is not a health concern. For more information see ‘External sites’ to read the previous European Food Safety Authority (EFSA) Opinion on BPA. Yes. There is European Union legislation that specifically restricts the amount of BPA that can migrate from plastic food contact materials into food. Additionally, the European Framework Regulation (EC) No. 1935/2004 requires that all materials and articles do not transfer their constituents to food in quantities that could endanger human health. However, there have been claims that BPA could be one of a large number of substances that may have the potential to interact with our hormone systems, also referred to as ‘endocrine disrupters’. Although there is evidence that some wildlife species have been affected by coming into contact with endocrine disrupters, there is still no conclusive evidence of a link between harmful effects on human reproductive health and exposure to these chemicals. Is it safe to drink from plastic (BPA-containing) bottles which have been left in the sun? 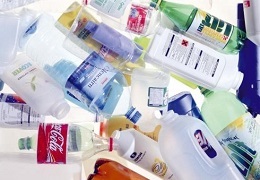 Most single-use beverage bottles sold in the UK are made from polyethylene terephthalate (PET) which does not contain BPA. While there is no evidence to suggest that exposure to sunlight accelerates the migration of chemicals at levels that would cause harm, manufacturers of these products often advise that they are stored in a cool dry place away from sunlight. Is EFSA carrying out another review? The Food Standards Agency monitors new research and reviews of BPA and will take action if needed to protect consumer health. The FSA will consider its advice and position on BPA in light of the EFSA opinion, and along with the European Commission and EU member states, whether any action is necessary to protect consumers.